The EntrePass scheme, originally launched in 2003, is a work visa meant for foreign entrepreneurs looking to establish their business in Singapore. In 2014, sweeping changes were announced to the evaluation criteria that subjected the applicants to a very stringent assessment. 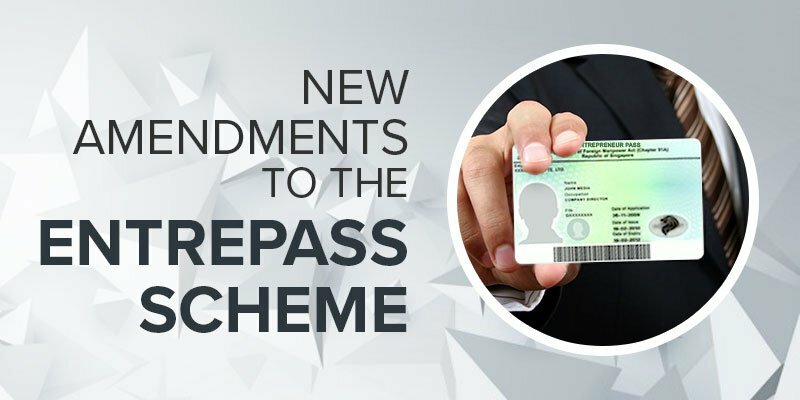 On 2 August 2017, the scheme was overhauled with further enhancements to the evaluation criteria, and the enhanced EntrePass scheme came into effect immediately. The applicant must have (or intend to start) a private limited company registered with the Accounting and Corporate Regulatory Authority. If registered, the company must be less than 6 months old on the date of EntrePass application. If the company has not been registered, this can be done after the outcome of the EntrePass application is known. Note: Prior to the enhancement, applicants were required to hold at least 30% share in the company. However now the 30% shareholding is not required at the time of the application and it is deferred until the end of year 1 of holding the EntrePass. Also previously the company registered by the applicant were required to have a paid-up share capital of at least $50,000. In order to facilitate the applicants who felt disadvantaged by this requirement, the government has now scrapped this requirement. Henceforth, applicants can wait for the outcome of their application before mobilising capital. In addition to the earlier four criteria that existed prior to the enhancement, three more have now been added. Consequently the applicants are required to meet any one of the following criteria as an Entrepreneur, Innovator or Investor. Entrepreneurs who are in the early stage of exploring the feasibility of the business and evaluating potential business partners but have not progressed to a stage of securing funding or partnerships can still apply for an EntrePass on the basis of their track record and accomplishments in their sector. Earlier, only those who had achieved considerable progress in their venture could become eligible. Most often entrepreneurs looking to establish in Singapore need at least a year to understand the market, evaluate its potential and calibrate their business model before establishing full-fledged operations. Though much of it could be done by traveling to Singapore frequently or by engaging consultants and advisors, it takes longer time and often results in wastage of resources. Most often, startup founders prefer to have an active role and first hand assessment in their ventures. An EntrePass is an ideal pass that allows a long-term stay enabling such early stage startup founders to focus on the business at hand. In addition to SPRING Singapore, the enhanced EntrePass scheme will see the inclusion of two new partner agencies – the Infocomm Media Development Authority (IMDA) and the National Research Foundation (NRF). Supported by SGInnovate, all three agencies will now evaluate the applications. This will enable the applicants’ business models to be evaluated more accurately for their viability and economic value and also potentially draw global startup talents from a wider range of high-tech sectors and enhance the value of Singapore’s innovation ecosystem. The validity period of each EntrePass will be extended from one to two years, after the initial renewal. An EntrePass, when first issued will be for a duration of 1+1 years, whereby the EntrePass holder will have to prove the progress of the business at the end of the first year before being granted extension for another year. Thereafter, following EntrePass renewals will be valid for 2 years. Prior to this extended validity, EntrePass renewals were valid for a period of one year only. This caused a lot of compliance pressure and anxiety for the pass holders. For instance, even renewal of lease for office was risky and led to a lot of decision dilemma. The extended validity of the pass would provide some certainty and assurance for the EntrePass holders to establish, plan and grow their business actively. The criteria for renewal have now been revised in the enhanced EntrePass scheme. Proof of business activities such as payment receipts, CPF contributions, share holding will be scrutinised to evaluate the eligibility for renewal. The EntrePass holders must fulfil the following minimum annual business spending and job creation for locals in order to qualify for the renewal. The minimum business spending has been substantially slashed. For instance, prior to the enhancement, applicants for renewal at the end of the second year were required to have a minimum business spending of S$150,000. Entrepreneurs felt that this requirement was too demanding for businesses that were gaining ground and trying to focus on increasing profitability and tightening cash flow. Also, the changes to the number of locals employed are also in favour of the EntrePass holders. The number is reduced now, for example in order to qualify for renewal at the end of the second year, instead of 4 local FTEs, only 3 full time local employees need to be employed now. Furthermore, the category of the local employees will also be taken into consideration, whereby one PME will be equal to 3 FTE, thus an EntrePass holder applying for renewal at the end of two years may just need to employ 1 PME to meet the headcount requirement. EntrePass holders can qualify for DPs for their spouses/children upon meeting Year 2 renewal criteria (minimum annual business spending of $100,000 and employ 3 local FTE or 1 PME). Earlier EntrePass holders were allowed to apply for DPs only after the end of first year and upon meeting the criteria of local employees and minimum business spending. The possibility of bringing along the immediate family earlier than before would be a great comfort for some entrepreneurs who wish to have the emotional support of their family while tackling the challenges of their startups. Related Article: What is Singapore Dependants Pass? Liaise with a dedicated specialist who will guide you through your EntrePass application and the drafting of your business plan. We are a licensed employment agency registered with the Ministry of Manpower and the Official Corporate Services Partner of ACE. Our reliable guidance and high success rate comes with 20 years of experience. Secure your EntrePass with us.